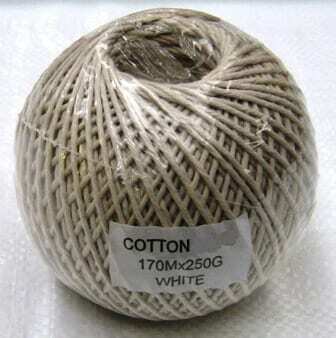 Cotton twine is an excellent choice for securing parcels, pursuing craft projects, tying back curtains and many more common uses. At Rope Services Direct we sell twine and cords of various lengths at a competitive price point. Like the natural fibre rope we manufacture, our cotton twine is Eco-friendly and a popular option for many of our customers. Cotton is a material that has lots of handy applications, so while it may not be as strong or durable as synthetic twines like polypropylene , it still has a lot of other assets to offer. A perk of cotton comes in the form of its ability to take on a range of coloured dyes, letting you customise your cotton twine in whatever way you see fit. If you have a particular creative vision for a craft project, or if you want to match the twine to an existing object, this is simple to achieve as a result. Of course, if the twine is going to be used for more practical purposes, such as hanging a picture frame or securing a package before postage takes place, then the standard, unbleached finish will be perfectly adequate. If you need to know more about this type of twine, contacting our experienced team could not be easier. Call us today on 01384 78004 or drop us an email to find out more about any of the products we sell. We look forward to hearing from you! Cotton Twine Overall rating: 5 out of 5 based on 6 reviews.